Counting and Reconciling Work in Process (WIP) Inventory . If you haven't already read the What is WIP? article, you may want to read that first. . The key to counting and reconciling Work-In-Process (WIP) is to avoid ever having to count and reconcile WIP at the account level. In other words, do what you have to do to keep the WIP account clean so you don’t need to count and reconcile it. That’s because, depending on your specific operation, trying to reconcile WIP by counting physical units may be near impossible and there are far better uses of your time. Granted, some of you may be in a position where your WIP account is a mess and you need to do something to clean it up, so I will give you some help with this, but I first want to cover what you should be doing ongoing to make sure you stay clean. Understanding WIP variances, and what you should do with them. WIP variances occur when the value of goods reported as completed from production doesn’t match the costs that were reported as used to produce the goods. The WIP account is often a single account used to track all production within a facility, so trying to identify and reconcile variances at the WIP account level can be challenging since you may constantly have active production going on. The key to keeping WIP clean, is reconciling WIP variances at the order level (production order, work order). When a production order is completed, it’s relatively easy to calculate all WIP activity associated with that production order. The costs associated with production for that order will show as positive values, and the value of goods reported as produced will show as negative values. The net value of the WIP activity associated with a completed production order is your variance for that production order. 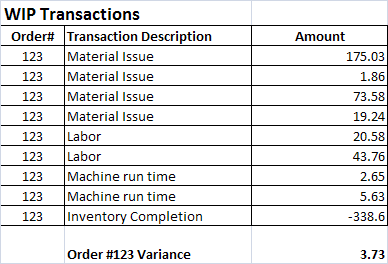 The figure above shows a very simple example of WIP transactions and a calculated variance associated with production order #123. In reality you could have hundreds of transactions associated with a single production order, and your variance report would likely show more detail on the transactions themselves. Once you know the variance for the production order, you need to do something with it. You know it doesn’t represent the value of any actual work-in-process so it doesn’t make sense to leave it in the WIP account. But where do I put it? Well, it’s a variance within the WIP account, so I guess I can create a “WIP Variance” account and move it there. But not quite yet. There are numerous things that can cause WIP variances, and we need to make sure we understand what makes up our WIP variances. Primarily, we need to distinguish the difference between what we would consider normal WIP variances related to the actual-cost-versus-standard-cost problem discussed earlier, and WIP variances related to production reporting errors. Production reporting errors can be a huge problem in some operations; the reporting process is sometimes complex and cumbersome, and the people doing the production reporting (often the shop floor workers) are sometimes not great at clerical tasks and data entry. It can be difficult to catch small production-reporting errors, but it’s important to catch the bigger ones because the ramifications of some of these errors go beyond the WIP account. For example, if an error is made in reporting the quantity of inventory consumed or produced, you not only have a problem with your WIP account, but also with your inventory balances. Reviewing WIP variances is actually a very good means of catching inventory errors. Exactly how you go about identifying these errors will depend on your specific processes. You need to understand the types of errors that are likely to occur in your operation, and look for clues that point to these types of errors. Abnormally large WIP variances are often a clue to a reporting error, but you shouldn’t get in the habit of only looking into large errors. You can also create exception reports that specifically show the difference between what was expected to be consumed (materials, labor)or produced, and what was actually consumed or produced at the detail level (at the specific item level, operation level, etc). If you find reporting errors, the best thing to do is fix them using the same program that was used to create them. So either reverse and re-enter the transaction, or enter an offsetting transaction. By using the same program, you will make sure you are fixing all related transactions. Ok, so you’ve fixed all the errors, and now all you have are “normal” WIP variances. This would be the point where you may want to move the variance to the WIP variance account. Ideally, your WIP variances are rather small and will tend to offset each other over time (some are positive variances, some are negative variances). Periodically you will need empty the WIP variance account by writing the amount off to a more tangible account (or you may just set the WIP variance account as a subaccount of a more tangible account). And I guess this is the time when I add the disclaimer that I am not an accountant. I’m an inventory guy that bumps into accounting issues periodically. My expertise here is with the transactional systems related to shop floor activity and how this affects the WIP account. I’m stretching a bit when it comes to specific accounts to move WIP variances to, so I’ll stop here. But I'll first throw in an appropriate Kramer quote: "They just write it off . . . . Jerry all these big companies they write off everything." It's probably already built into your manufacturing software. The process I described so far is actually a normal part of production-order processing. In fact, your manufacturing system probably has tools and a workflow designed around this. There is often a step in the production-order process that requires approval and posting of variances to the WIP variance account. It occurs after the shop floor has completed all production reporting, but before the production is considered “closed”. It will typically provide a report (either a physical report or a computer screen) that shows WIP variances at the order level for all orders reported as completed by the shop floor. Once approved, the variances will automatically move from the WIP account to the variance account. As I mentioned before, your WIP variance account really shouldn’t amount to all that much. If your system is set up correctly and your costing methods are sound, the variances should be a fairly consistent mix of positive and negative variances that should net out to very little over time. If, however, your WIP variance account grows (either positively or negatively), you probably have something wrong with your system setup or your costing methods. Scrap is a good example of this. If you have some production scrap built into the cost of the finished items, you would want to make sure any scrap reported during production goes into the WIP account. If you don’t have production scrap built into the cost of the finished items, you would want scrap reported during production going to a separate scrap account. Other problems could include actual labor rates being used for reporting labor being different than the labor rates used in the standard-costing calculation, failing to report setup or machine run times, and of course, estimated production rates being consistently different than actual production rates. How to reconcile that long neglected mess of a WIP account. For those of you that haven’t been reconciling WIP at the production-order level (as covered previously), you may have a WIP account that is a real mess. Your first thought may be that you need to physically count your WIP in order to clean it up. But if you think about the process we used to reconcile WIP at the production-order level as production orders were completed, you’ll realize you may be able to adapt that logic to clean all the old garbage out of your WIP account. In that process we identified all transactions associated with a production order as it was completed, netted the amounts and moved the variance out of WIP. What you may be able to do now is identify all transactions associated with currently active production orders, and net that out. That is what your WIP account should be. You can then take the difference between that amount and the value of your actual WIP account and move that to a variance account. To do this you need to first identify “active orders”. You can probably do that based on statuses in the production-order file. Then link those order numbers to the transaction file associated with the WIP account (the transactions should have a reference on the records to the original production order). This should be fairly simple to do for anyone with a little query experience. You should also first check to see if your software already has a report that does this though (you may get lucky). This should work for most of you, but there are always exceptions. I’ve run into systems that re-use order numbers or follow other non-standard practices that may not work with this logic. You’ll have to do some investigation to see what you have to work with. I’m not saying there is always a way, but there usually is. But what if you still want to “count” your WIP. I’ll again try to discourage your from going this route. You are probably more likely to make a mess of your account than fix it, and in some operations this may be near impossible. Though I guess I should be fair and mention that in some operations this may be rather easy. If your heart is set on it, you need to first make sure you have a complete understanding of your production-order process, your transaction methods, your BOMs, your routings, your costing methods, and anything else that may effect your WIP account. This is going to be different for different companies, so I can’t give you a clear path here, but you’ll need to reconcile what has physically been done to each production order, with what has been reported as being done. (remember, you may not even have physical items that represent WIP—you may just have setup). For complex production processes, you may need to do this at each step (operation) in the routing for each production order. You can see how challenging this can be. And if you do make adjustments for active production orders, make sure you account for this when you complete those orders and go through the standard production-order WIP variance process (assuming you will be doing this). You don't want to end up duplicating "corrections". I have encountered some manufacturing software programs that claim to have "WIP cycle counting" functionality built into them. I would assume they break down all the transactions at the operation level within the production order, and provide a report (count sheet) of what should physically exist at each operation. I haven't actually gotten into the details of any of these programs, so this is just speculation on my part. If you do have this type of functionality and plan to use it, make sure you first figure out exactly what it is doing. Cycle counting can be dangerous if not done right, and WIP only makes it more risky. Well I hope this helps to clear up some of the confusion related work-in-process, the WIP account, and WIP variances. The WIP account doesn't have to be the nightmare it's often made out to be. If you review orders as they are completed, make adjustments and move variances out of WIP, and use what you learn to make sure your system setup and costing methods are correct, your WIP account will stay relatively clean. If you haven't already read the What is WIP? article, you may want to read that as well.